Emil Guillermo: After Florence and Mangkhut, time to talk seriously about climate change? It’s just been a few days since the world saw two major catastrophic weather events– in Asia and America–develop and land simultaneously. If you do, kindly continue to bury your head in the sand, but for fun and emphasis do switch out the sand with a big bucket of methane-producing cow dung. Now do you see how methane traps the air and produces the kind of weather patterns we’ve seen that comes from climate change? But do give yourself points for knowing the globe was undergoing two major weather events over the past weekend from the Carolinas to San Guillermo barangay in the Philippines. As further proof that all hurricanes, like politics, are local, the coverage of Florence off the U.S. Carolina coast was rather parochial and sensationalistic as the media tracked the storm from Monday through the weekend. While windy and ominous, Flo was soon said to be a mere 1,000-year rain event by Saturday, as if flooding and surges weren’t significant enough. They are, of course, and despite the downgrade, early reports say Florence (whether you want to brand her a hurricane, tropical storm, or whatever) had claimed at least 14 lives. Of course, that number is sure to rise. That might be enough extreme weather for a September weekend if you were just paying attention to the America-centric media. For many, the anticipation of Flo took over the news. Even the new plea deal of convicted Trump campaign manager Paul Manafort (who won’t wait for a Trump pardon, he’ll spill the beans now) hardly got the coverage it deserved. And Brett Kavanaugh as an alleged aggressive high school masher? (Why didn’t California Senator Feinstein speak up sooner? Will we talk about it now that the accuser has come forward? I was a DC talk show host when Anita Hill challenged Clarence Thomas and can see the uproar building. The KavMan really was a CaveMan? Accuser Christine Blasey Ford might out-hurricane Florence). But for right now, Flo has trumped all Trumpy-related news. It even obscured the gestation of Super Typhoon Mangkhut. Mangkhut sneaked up on everyone not paying attention to the rest of the world. Heading straight for Hong Kong via the Philippines and Central Luzon, Mangkhut, a/k/a Ompong in the Philippines, caught my Ilocano family’s attention on Friday. From Laoag City in the northern Philippines, they posted the barangay official’s videos on social media, and let relatives know they were all praying, but safe. 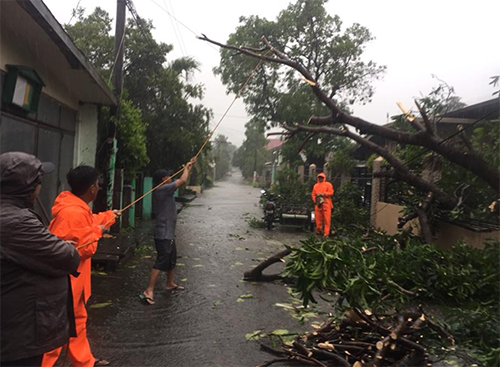 Later, some relatives were out with the Barangay San Guillermo councilor trimming downed trees and fetching roof parts that had been blown off. No one in my family was hurt. But many of their neighbors are still wondering how they will take care of all the damage. Early death toll figures for Mangkhut were relatively low, around 25, but that’s a number still higher than Florence, and we’re not done yet. Mangkhut was a storm that was said to be more powerful than Florence, and even Super Typhoon Haiyan in 2013. You’ll recall Haiyan (a/k/a Yolanda) devastated Leyte and the Central Philippines leaving more than 6,000 people dead. Note, Haiyan’s 6,000 is nearly double Puerto Rico’s 2,975 total from last year’s Hurricane Maria, an amount that is being disputed without evidence by President Trump. Maybe that’s because Trump would rather count the individual bodies himself. Or make son-in-law Jared do it. Of course, Trump applies his colonial math, whereby 2,975 American citizens, from the U.S. territory, are at least divided in half, since they can’t vote as second class citizens. That’s the way Puerto Rico’s Governor Ricardo Rossello sees it. You mean the unfinished business of the Spanish American War where the Philippines became a colony but broke away when the U.S. tired of Filipino men coming to the states? America spun what was essentially the Filipino Exclusion Act of 1934 as the law that also gave the Philippines independence. But they kept Puerto Rico as a territory and made its people citizens of the U.S. without voting rights and representation. That’s more than a colonial hangover. Cuba was too big. The Philippines was too far. Puerto Rico was just right for nouvelle colonialism. But the death toll game is just a distraction. One death is too many. Still, Donald Trump, chief climate denier, doesn’t care. What we’re to make of all this is that hurricanes aren’t all local after all. They’re global, because what you do in one part of the world has an impact on the weather in other parts of the world. A warming atmosphere will result in rain and flooding. Oceans warming will result in intense winds and hurricanes. That’s the impact of our increased carbon footprint, which traps the greenhouse gases that warm the climate and wreak havoc on weather systems. How warm has it been lately? Just the fourth hottest year on record. In San Francisco this past week, the climate change warriors got together for a summit to discuss best practices to make a difference. California is the world’s fifth largest economy, with a Gross State Product at $2.747 trillion that is bigger than the United Kingdom’s Gross Domestic Product. California, the most Asian American state in the nation, has taken it upon itself to stay in line with the Paris agreement on climate change, even if the Trump-led U.S. has refused. The state just passed a law making its utility companies go 100 percent zero carbon by 2045. It also has a goal to have 5 million electric cars on the road by 2030. All this while Trump gleefully rolls back every climate change gain, most of them linked to Obama. If you didn’t hear about the summit, maybe it’s because all the hurricane news from both ends of the world ate up all the news space. Just remember, when you see TV news scenes from Florence or Mangkhut, that’s your climate change update. We didn’t get off so easy after all. And now it’s time we start owning it while we still have a planet. If you drive a gas car, or eat meat (which produces tons of methane in processing, which traps heat and creates warming), or are part of a state or institution that remains apathetic to climate change, you helped contribute to it all. Listen to that video from the San Guillermo barangay in Laoag City, Philippines again. That wind, the rain, the chimes–it’s a message for all of us.